Have you found yourself surprised by a game releasing, missing open beta signups, or just wondering if there are streamer meetups in your area? As a streamer, it’s both imperative and difficult to keep track of all the games coming out, which platforms they are on, and when there are early access opportunities. Well, we’re about to make it much easier for you. Introducing Streamer Calendars! We’ve organized six different calendars to help you follow important dates surrounding streaming. Five of our calendars are game release calendars. These calendars will help you stay on top of game releases and betas for the following systems: PC, PS4, Xbox One, and Other (Mac, Linux, WiiU, Vive, Rift). 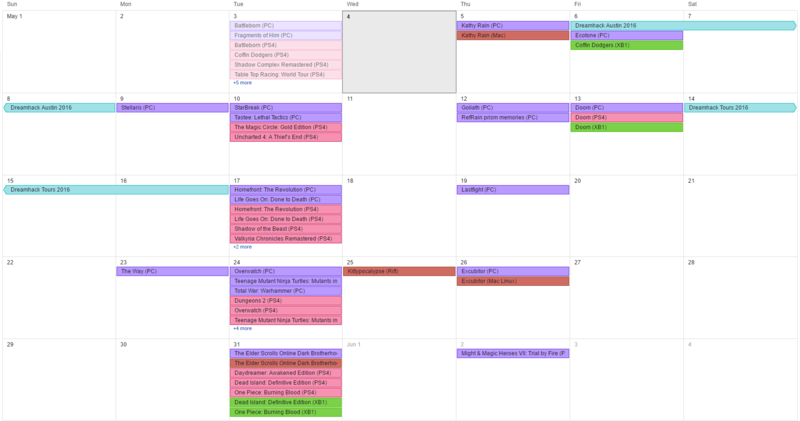 In addition, we have a combined game release calendar which displays release dates for all systems in one calendar. Our sixth calendar is a Streamer Event Calendar. This one serves to display any conventions or meetups that take place. All of these are based in Google Calendars, so we’ve provided iCal links for each one. This allows you add each to your own Google Calendar so you can set reminders for events and edit it to your liking. 1. Open your own Google Calendar. 2. Click the arrow next to “Other Calendars” and select “Add by URL”, a box will appear. 3. Copy and Paste the iCAL link for the calendar you want into the box and click “OK”. Are we missing something from one of our calendars? Have an idea for a new calendar? Tweet us @StreamerSquare or join our Discord server. Next articleTwitch Friends Invite-Only Beta is Here!